This volume encompasses a wide range of empirical research on a variety of topics that are related by their focus on the importance of attitudes, culture, and perceptions. 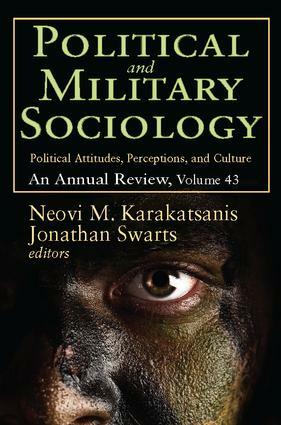 The significance of public attitudes, the impact of cultural norms, and the perceptions of military officers and civilians are all analysed in the seven articles in this latest edition of Political and Military Sociology.The first essay asserts that military memoirs should be taken seriously as objects of scholarly analysis. Using the Minorities at Risk Dataset, the second article examines the effects of globalization on ethnic conflict in 106 countries from 1985 to 2002. The next focuses on Canadian attitudes toward military expenditures following the September 11th terrorist attacks. The fourth examines the attitudes of Texans toward recent US wars, the draft, and military service generally.The fifth essay explores the role of the media in promoting democracy and democratic attitudes in southern Africa. Using survey data, the following article addresses the extent to which higher education promotes more tolerant attitudes among Israeli Jews toward Israeli Arabs. The volume concludes with a study of US warrant officers that shows how the rank has evolved over time. To What Extent Do Media Promote Democracy in Southern Africa?